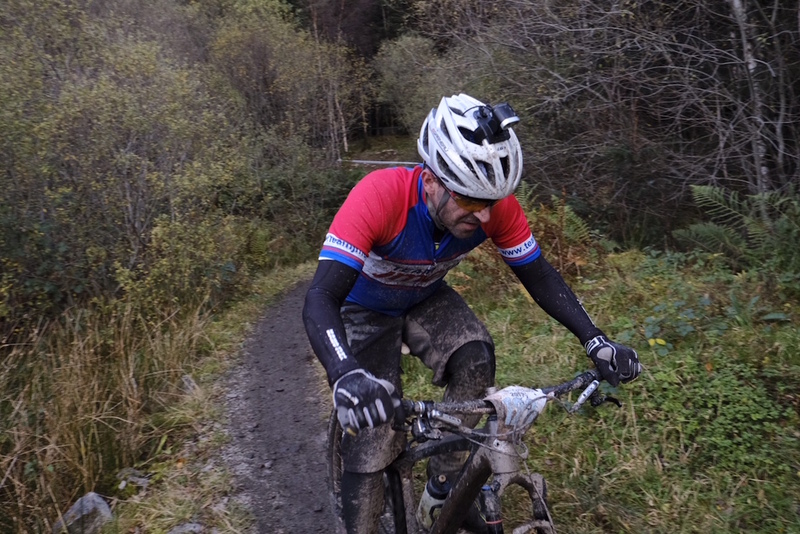 When it comes to putting in the miles in wet, muddy and generally miserable conditions, our local hardman, Daz, was more than up to the task. 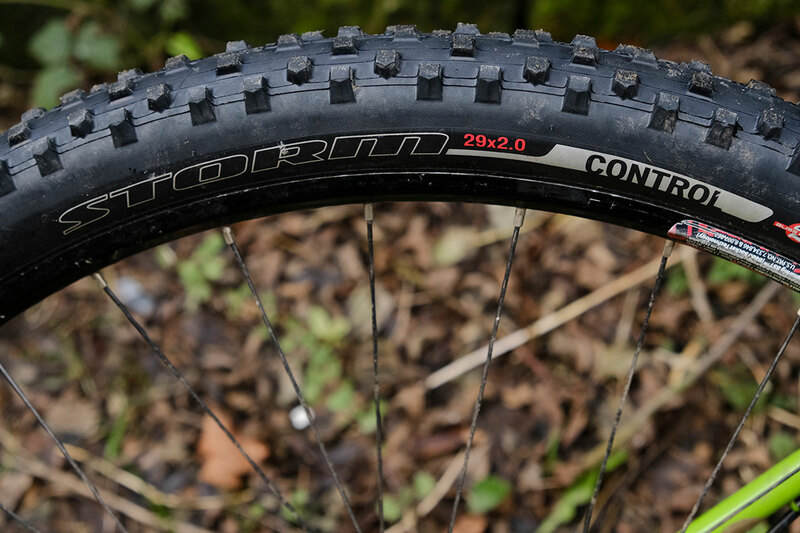 Read on for his comparative review of the Bontrager XR Mud and Specialized Storm Control tyres. 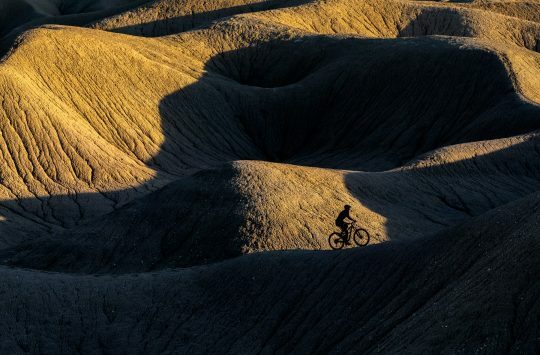 When I first started mountain biking, mud was something I both accepted and despised. It was fun getting caked head to toe in filth, but not much fun having to dismount, sometimes unexpectedly, because it was impossible to ride through 12in deep slop. Eventually like many riders, I began to avoid boggy conditions and became a reluctant fair-weather rider. Modern mud-specific tyres have made vast improvements on their early brethren. 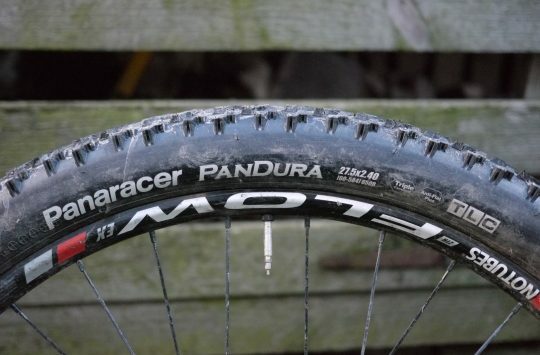 Back in the day riding mud-specific tyres came at the sacrifice of grip on any other type of surface, rolling resistance on hard surfaces that felt like you were still slogging through the slop, and required tyre pressures that turned even smooth rides into bone-jarring feats of endurance. Thankfully improvements in rubber compounds, tread patterns and the advent of tubeless technology mean that riding through bogs and ‘normal’ terrain need not be the trade-off it once was. The result is a generation of mud-specific tyres to propel you through the gloop that will also roll and grip on non-muddy terrain, and provide the comfort and reassurance of something that feels much fatter. Daz. Loves a bit of filfth. Here we have two examples of this new generation of mud tyres. The Bontrager XR Mud Team Issue 2.0 (£39.99 per tyre), and the Specialized Storm Control 2.0 (£35 per tyre). Both in 29er guise. We tested these over a few months of a Calderdale winter and on a winter 24 hour race at Kielder Forest, which involved conditions the likes of which I’ve not seen in quite some time. After last winter, they were fitted back onto the bike a few months ago as I got reacquainted with the joy-sucking dampness of Autumn. In the 12 months I’ve been using these, both tyres have been run at pressures around 30psi on Stan’s NoTubes Crest rims and ridden on both geared and singlespeed hardtails. 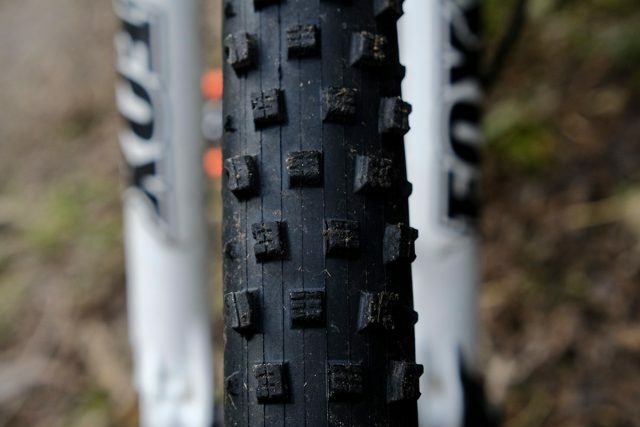 Skinny 29er tyres for cutting through the gloop. 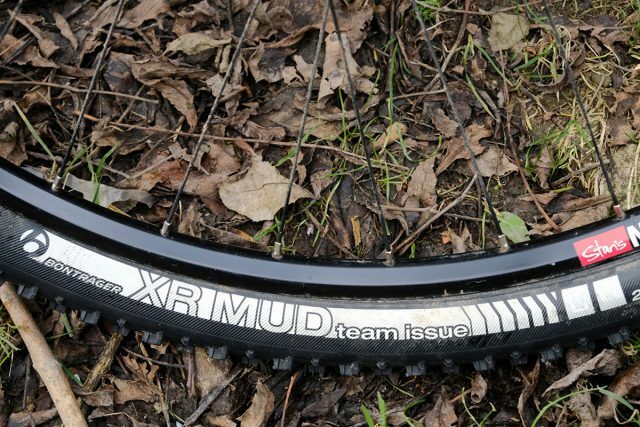 The XR Mud tyre is a mud-specific race tyre that’s constructed with a supple 120tpi casing and a single 50a rubber compound. The actual width came out at pretty much bang on 52mm, while weight for a well-used tyre was 660g – a bit heavier than the specified 600g, but I think there’s probably a fair bit of dried latex sealant that’s built up on the inside of the tyre. The lightweight casing is definitely noticeable, but that’s not to say these are in any way fragile. 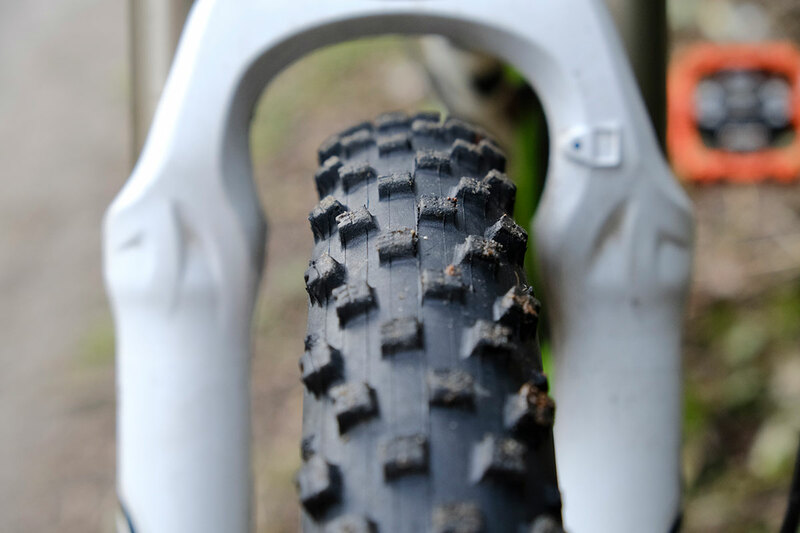 The sidewalls are reinforced with the Inner Strength casing, and after over three months of riding, some in race conditions, no punctures were experienced and the tyres are still in great condition. The simply named XR Mud from Bontrager. They come tubeless ready, a little too ready maybe, as wrestling these on to a Crest rim and getting them off again was an exercise in frustration that involved much swearing and the unfortunate loss of two plastic tyre levers. Once on though, they sealed first go with a few pumps of a track pump and remained inflated. The tread employs fairly typical square knobs down the centre of the tyre with angled shoulder knobs. Supposedly these are trimmable for customisation but that would require an exercise in tech geekery and marginal gain chasing unbefitting my own meagre talents. These measured pretty much right on 2.0in wide, and came in at 660g per tyre. A blocky tread pattern delivers good mud-shedding abilities. On the trail the first thing noticeable is that these are fast, both in terms of the weight and the rolling resistance. On soft ground the usual drag is hardly noticeable and once you hit the gloop they keep biting resulting in very little slippage, even whilst out of the saddle. 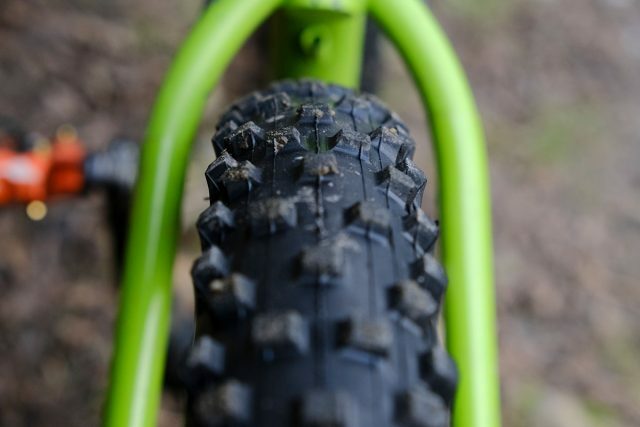 Cornering is reassuringly predictable once those angled shoulder knobs bite and they feel as stable and comfortable on rough terrain that you’d expect from a much fatter tyre. The only surface on which they struggled was wet cobbles, but I’ve yet to find a tyre that can cope with those so it’s hardly a negative. 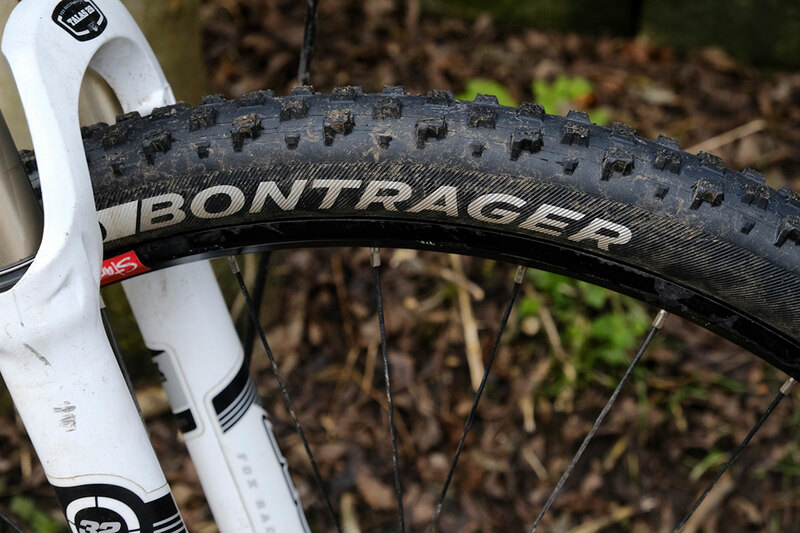 Note: Bontrager recently introduced a new version of the XR Mud tyre, which features a very slightly revised tread pattern. The 120tpi casing stays the same, though claimed weight has gone up a touch, and the rubber has changed to a firmer 60/62a dual compound. The Storm Control is a skinnier and lighter version of Specialialized’s downhill mud tyre. 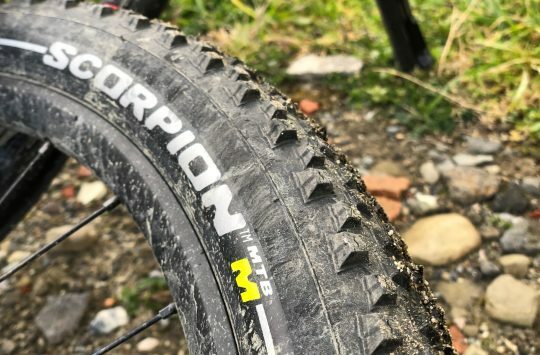 The Storm Control looks very much like a scaled down version of the Storm DH tyre, and marketed as a mud-specific XC tyre that’s got an extra dose of versatility for general trail riding. The specs come out at 47mm width which is slightly under the 2.0 inch specification and – funnily enough – exactly the same weight as the Bontrager tyres at 660g (claimed weight is 620g per tyre). 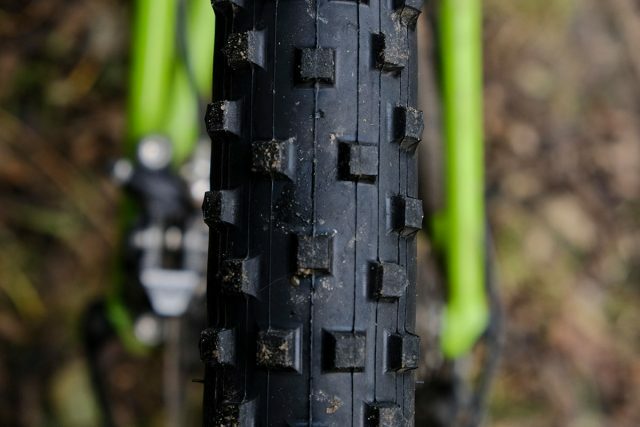 The tread consists of square blocks, slightly more spaced apart than on the Bontrager XR’s, and with a higher profile, giving an appearance of greater width despite being narrower in reality. To the touch, the 60TPI casing and 60a compound feels more burly and robust than the XRs as you’d probably expect. These measure in a little narrower than the Bontragers. Again these are tubeless ready but the installation and removal experience was radically different. It’s almost a luxury these days to be able to install a tyre with just your finger and thumbs, but these went straight on, and came straight off. No dramas. The downside of course is that I couldn’t for the life of me get these to seal with a track pump, so I had to employ compressed air via an Airshot, and they took a ride or two to fully seal. The ride experience was very much as claimed. They did indeed cut through mud with a minimum of wheel-spinning, and held their own on roots and rocks. I’m not sure if it was the slightly more aggressive knobs or thicker construction, but they also felt a little more secure than the XRs. As for the wet cobbles, well, the less said the better. Slightly taller knobs are spaced further apart, giving a little more grip in really slurpy mud. There’s very little between these two. They both performed exceptionally well in the sorts of muddy bogs that many other non-mud specific tyres would have you off and walking. That’s not really a surprise though. What was surprising was the extent to which they performed as all-rounders. I’d have no problem with leaving either of these on for the whole year, and have done just that on one of my bikes. it seems that the old days of winter tyres being only suitable for the really crappy months are gone – these tyres are far more versatile than their predecessors. If you’re into racing, then the Bontrager XRs would suit better, as long as you don’t puncture halfway round a lap and have to take the tyre off. In fact a pairing of an XR on the front and the Storm Control on the back might be the ultimate combination. The one thing you can be certain of though, is that there is no longer any need to avoid the gloop. Or at least, you have fewer excuses anyway. Agree re all year use. Had the XR MUDs on the hardtail since this time last year. Thanks for the review. Have you also tried a Beaver, if so how would you compare it? Which would you describe as the fastest rolling in firmer conditions?